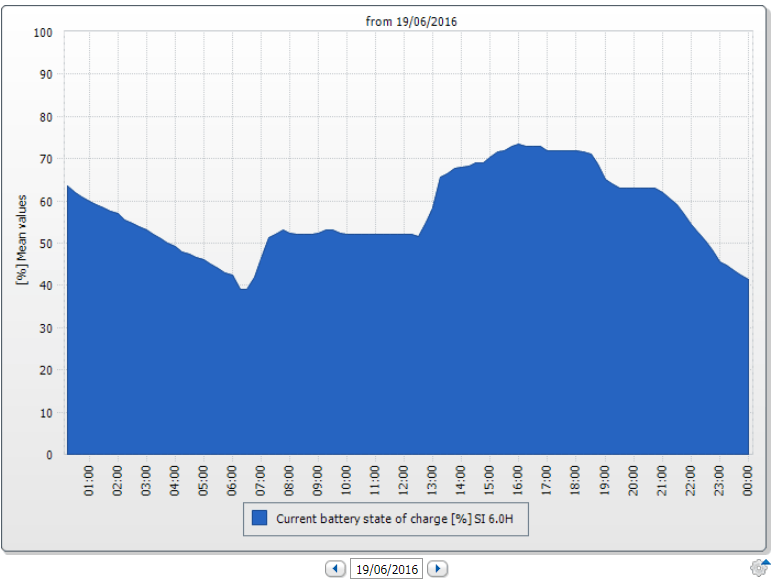 Why use forecast-based battery charging? If local connection conditions or incentive programs require a curtailment of PV systems, PV system operators can increase the efficiency of their PV system by using forecast-based battery charging. 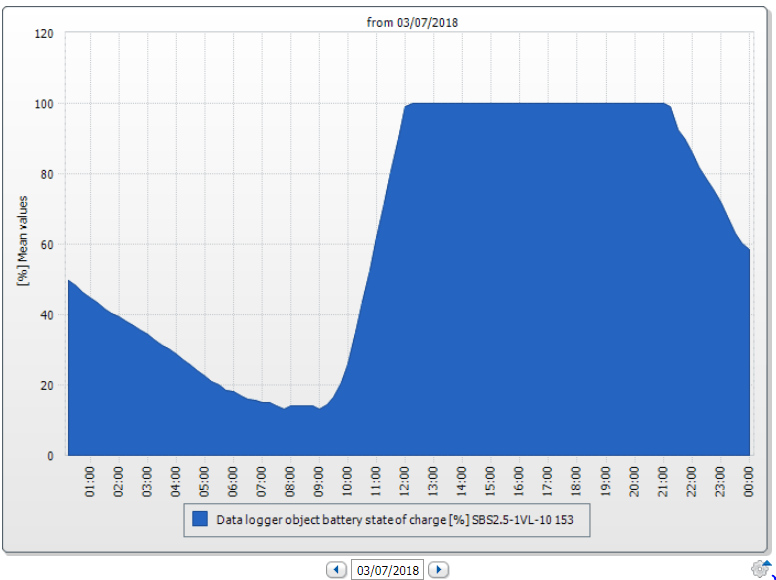 What happens without using forecast-based battery charging? A surplus of PV energy is already available in the morning, especially on sunny days, meaning that the battery is already fully charged before noon. As a result, the PV feed-in has to be limited at midday because the battery can no longer accommodate the surplus PV energy. Any solar energy generated at midday can no longer be charged to the battery because the battery was already fully charged in the morning. 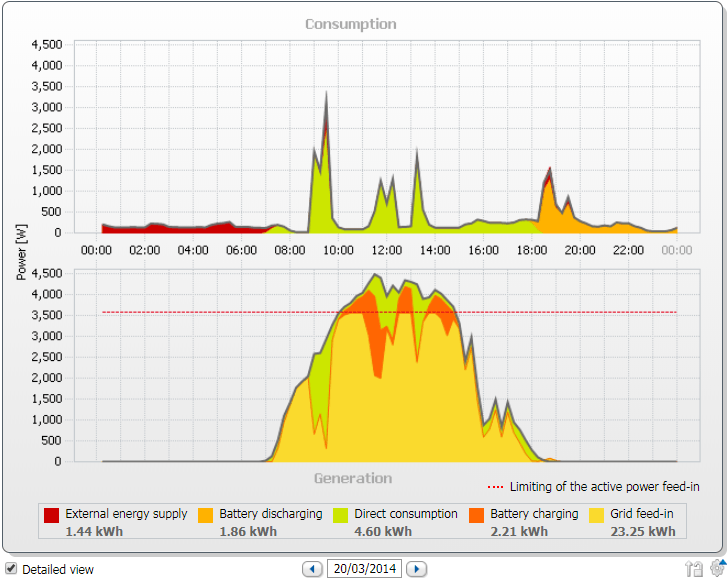 The PV feed-in power therefore has to be curtailed at midday. (Figure 1). 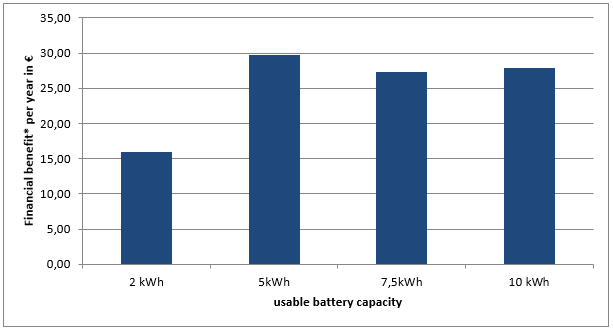 The battery often remains fully charged for several hours until the evening (Figure 2). 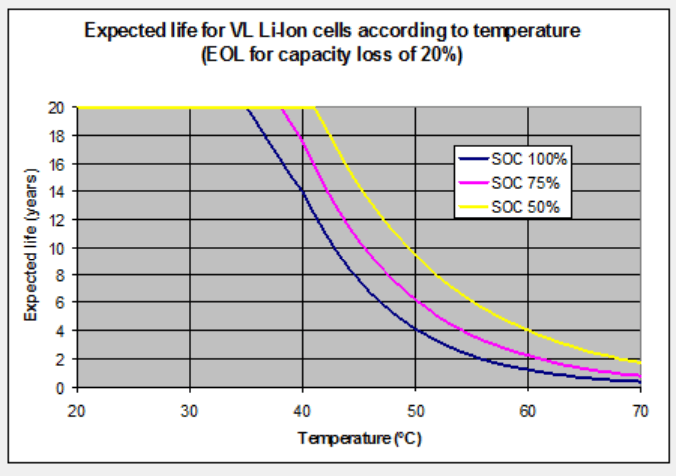 As a result of electrochemical processes, this leads to faster calendrical aging, especially with lithium-ion batteries (Figure 3). 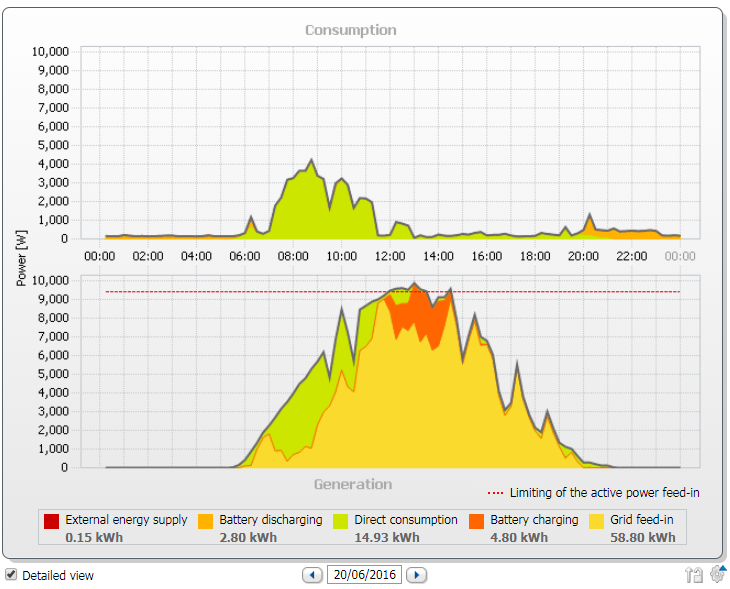 In SMA PV storage systems, Sunny Home Manager 2.0 (SHM 2.0) enables forecast-based battery charging. Thanks to a weather forecast based on Internet data and by adapting this to the local conditions, the system can accurately predict solar irradiation for a few hours to a few days. SHM 2.0 also forecasts the consumption habits of the PV system operator. The system has the two most important pieces of information it needs for calculating when the nominal PV system power exceeds the maximum given feed-in line at the grid-connection point. This occurs mostly at midday, which is why it is also known as the “midday peak.” Sunny Home Manager forecasts how much PV energy would be curtailed or would not be generated. The aim is to charge the midday peak into the battery — at precisely the point when the PV system would actually have to reduce its feed-in power. This limitation of the reduction is also known as “Limiting of the active power feed-in“ (Figure 4). Furthermore, the Sunny Home Manager checked whether curtailment losses are expected for the next day. If yes, it will charge only a sufficient amount of PV-surplus into the battery on the current day or the early morning of the next day to avoid grid demand at night. Due to this, the battery is now able to charge more PV-surplus of the PV peak at midday of the next day – more free storage capacity. As a result, often no curtailment takes place. More PV-yield for the system owner. 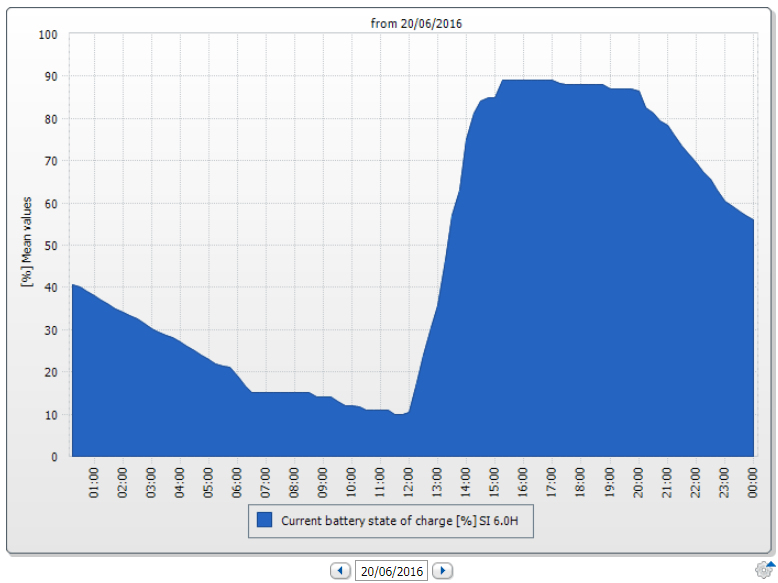 On June 19, 2014, the battery was charged during the day just up to a battery SOC (state of charge) of about 70%, although other surplus PV power would have been available for battery charging. Why? 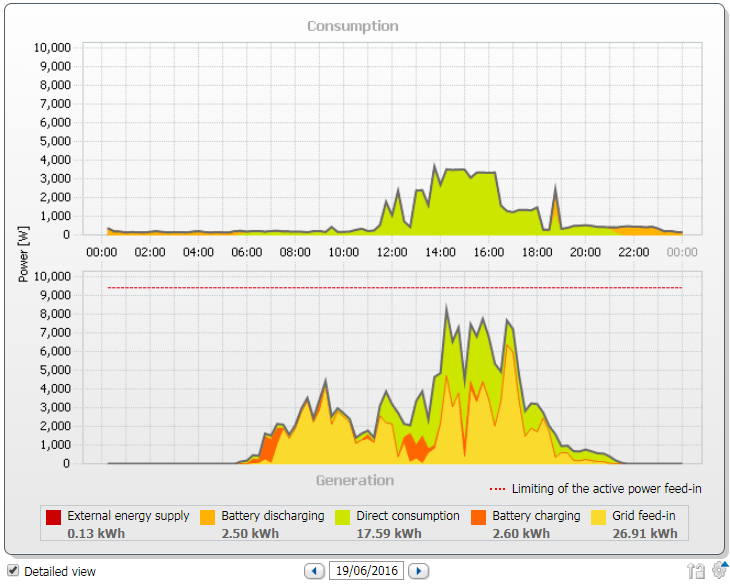 Sunny Home Manager had forecast that the energy stored in the batteries up until then and the still available PV energy of the current day are sufficient to avoid purchased electricity (Figures 5–8). On the following day, sufficient, temporarily stored energy from the battery storage system is still available for the early morning hours. 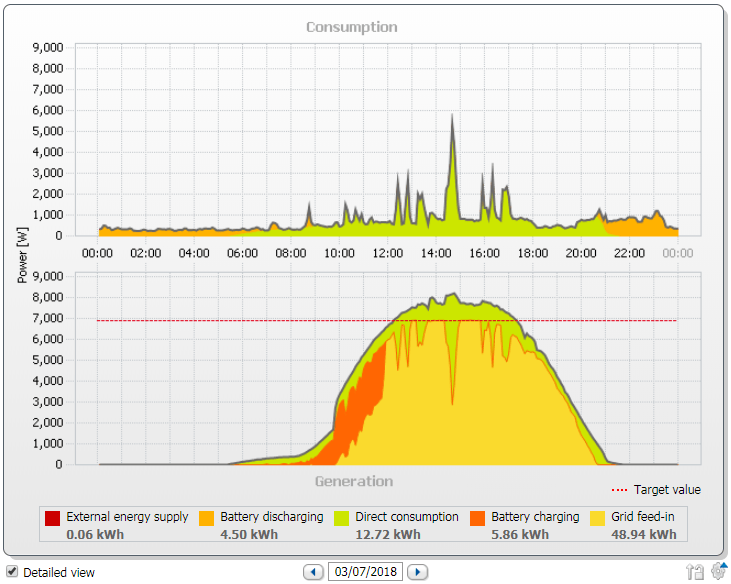 The PV feed-in power does not have to be curtailed at midday because the battery begins its delayed charge from about 12 p.m. and absorbs the excess PV energy (Figures 7–8). What do I need for forecast-based battery charging? → At 50% curtailment (see KFW funding, Bavarian funding and Baden-Württemberg funding provisions), a yearly profit of €25–38 is achieved due to the higher PV yield (grid feed-in). Some incentive programs offer additional incentives for using forecast-based battery charging. The incentive program for PV storage systems in Baden-Württemberg, for example, offers a one-time bonus of €250 for forecast-based battery charging. Thanks to forecast-based battery charging, PV system operators generate higher PV yields and also lengthen the calendar service life of the lithium-ion battery. Basically, if your battery is once again not fully charged, this is no cause for concern. IT’S NOT A BUG — IT’S A FEATURE.